Mikhail Grigorenko notched a pair of assists Sunday as Quebec blanked Baie-Comeau 5-0. Both of Grigorenko's helpers came on goals by Florida prospect Logan Shaw. Grigorenko now has six points after his first two games. The 6-foot-3 pivot rounded out his line with four shots on goal, a +3 rating, and a 60% success rate at the faceoff circle (18/30). 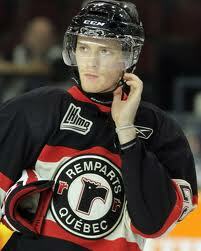 The Remparts are off until Saturday when they visit QMJHL newcomer, Sherbrooke. In the WHL, Colin Jacobs followed his five-point effort with an assist and a shootout marker as Prince George edged Everett 7-6. Jacobs (2+4) enters the week as the WHL's second-leading scorer behind Portland's Nicolas Pedan ('13), who has eight points in three games. Prince George welcomes Jacobs' former mates from Seattle to town next weekend. Alex Lepkowski picked up hsi first point of the year, a power play assist, as Barrie dropped a 3-2 decision at Mississauga. The Colts host Dan Catenacci and the Owen Sound Attack on Thursday. Grigo should be in the AHL this year!